In a sense, the increased activity in May was less a return to an active Sun and more a reflection of the Sun’s 27-day rotation period. I have noted this previously but it bears repeating. We count sunspots by the number seen daily on the visible hemisphere of the Sun. Since it is not unusual for sunspot activity to be unevenly distributed across the entire solar globe, it often happens that, during the time when sunspot activity is weak but still occurring, one hemisphere will be blank while the other has sunspots. As the Sun rotates we therefore go through a two week period with no sunspots followed by a two week stretch with increased activity. 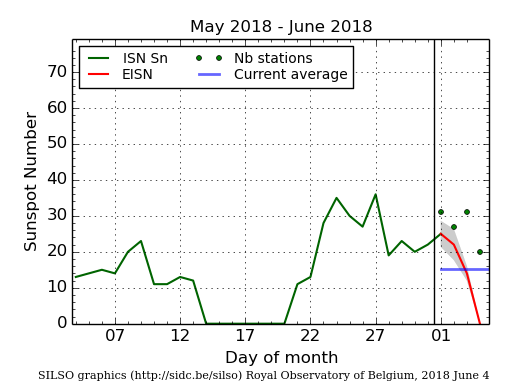 This happened in May, as shown by the SILSO graph on the right. While a majority of the Sun’s surface had some sunspots in May, there was a week-long period mid-month when no sunspots were visible. It was at this time that the hemisphere that happened to be less active was facing us. That quiet period ended on May 20th. Based on the Sun’s 27-day rotation period, you could then predict that a quiet period would next return around two weeks later, around June 1st. And lo and behold, if you look at the graph on the right you will see that on June 3rd the Sun returned to a blank state once again. Obviously, this type of prediction is very superficial and explains nothing. Moreover, it is reliable only for short periods, as sunspot activity on the surface eventually shifts about so that no specific hemisphere of the Sun remains blank for long. Nonetheless, the fact that about half the Sun’s surface is now routinely blank is another indication that we are heading toward solar minimum, and it looks like we shall reach it, based on the first graph above, sometime late this year or early in 2019. This will make this solar cycle a short ten-year-long cycle. It will also be a weak cycle. This is unprecedented, as in the past short cycles were always more active, not less. The Sun continues to baffle, and exhibit behavior that we have not seen in more than three hundred years, since the last Grand Minimum. Well, not quite true! It does explain the scatter in data near solar minimum, and that we need to remember that solar minimum has not yet come. However, the whole solar sun spot cycle is just one indicator for “something” is going on in solar dynamics. We are having a treasure trove of data right now, unprecedented in history: a possible chance to document what happens during a grand minimum. As with any research, as some questions are answered, many more come to “light”.